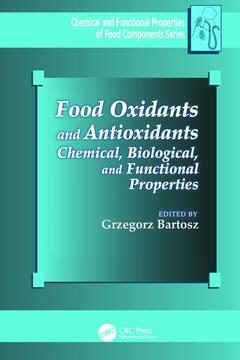 This volume discusses the effects of naturally occurring and process-generated pro-oxidants and antioxidants on various aspects of food quality. It emphasizes the chemical nature and functional properties of these compounds and their interactions with other food components in storage and processing, specifically focusing on the sensory quality, nutritional value, health promoting activity, and safety aspects of foods. It demonstrates the analysis of pro-oxidants and antioxidants in foods, their mechanism and activity, their chemistry and biochemistry, and the practical considerations of healthy food production and marketing. Food technologists in the food industry and in food quality control, food chemists, nutritionists, and regulators and government researchers in US FDA, USDA, and UK FSA regulatory agencies.